The Cavalier King Charles Spaniel originated in England and is strongly associated with King Charles II who was very rarely seen without his dogs. Henry, Charles, Mary, and Anne are few names ideas coming from English monarchs. Some name options taken from mistresses of King Charles II include Moll, Gwyn, and Lucy. 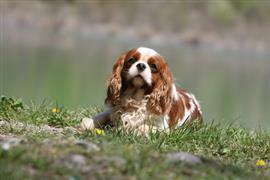 The King Charles Spaniel is one of the largest breeds that falls into the toy classification. Some fun name ideas can be borrowed from sizeable but popular children’s toys. Hasbro (borrowed from the creator of the classic inchworm ride-on toy), Kraft (after KidKraft which manufactures kitchens and playsets), and Avalon (children's tables) are a few of options that fall into this category. Television is one of the most popular sources of dog names, but most people focus on their favorite characters of today. Many quality names can be taken from the classics that families have grown to love. Lucy (from 'I Love Lucy'), Wally ('Leave it to Beaver'), and Bee ('The Andy Griffith Show') are just a small sampling of many favorites from the past. Some of our pages will contain a subcategory. A subcategory is a slightly more specific grouping than the main topic of the page. For a subcategory, we will include a separated table of names and corresponding descriptions. An example of a subcategory of Red Dog Names would be 'Dog Names Inspired by Red Wines'. If you have any subcategory ideas for the King Charles Spaniel Names page, we would love to hear them. Use the form below to submit your ideas.